As the National Hockey League playoffs commence — they are held annually at this time except in those years in which the entire season is canceled — I would like to apologize to my NHL friends and associates for decades of high-sticking, power-play neglect. As my long-time editors and readers know, I only write about the NHL when it has a labor dispute. Gratefully, league management and the players union have cooperated with four work stoppages in the past quarter-century or so, and in 2004–05, I was bequeathed The Greatest Gift in Column History when the NHL became the first professional sports league to lose an entire season. Thank you, NHL Players Association. But times change, sports pundits mature and Couch Slouch is ready to make amends by celebrating the NHL. Curiously, I was convinced to do this by a woman who had not even watched a single NHL game until 10 years ago. The story of Anna Guido Perrone’s journey to hockey nirvana is the story of an evolving, gender role-reversal America. Sociologists and anthropologists should take note. Anna and Vinnie Perrone were wed in 1984, several years after the three of us graduated from the University of Maryland without honors. They fell into the usual suburban, marital routine — Vinnie watching untold hours of sports on TV and Anna ridiculing him for his pointless, ambitionless home-entertainment pursuit. So finally, in 2009, Anna — a career federal government worker who specialized in federal government work — suddenly decided, in some type of crazy karmic conjugal kickback, to start watching hockey games. Anna says she had been going to a fitness center located in the Gardens Ice House skating and hockey facility in Laurel, Maryland, and got hooked on hockey watching it there. Yeah, well, I believe it was a midlife crisis and a cry for help. What college-educated woman, a hardened, inveterate nonsports fan, starts watching NHL games as a fortysomething? It would be saner to start smoking cigarettes after moving into Biosphere 2. In addition, Anna — who has difficulty changing lanes safely on the Capital Beltway in a Toyota Camry — got a certificate of achievement for participating in a Zamboni driving class. 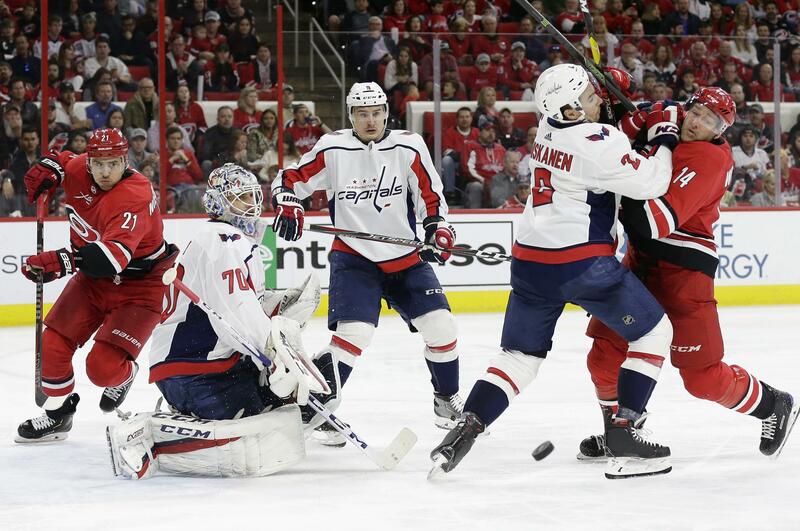 These days, Anna seldom misses a Washington Capitals game — she actually prefers it on TV than in person, a rarity among NHL habitués — and sees most every minute they play. Meanwhile, Vinnie, frustrated by MLB’s now-you-see-it now-you-don’t strike zone and the Orioles’ long descent into baseball hell, stopped watching altogether, reducing him to organizing his coupon folder daily. Anna now controls the clicker and Vinnie whines that she’s wasting her life. Huh. Anyway, Anna decided to sell me on the NHL’s merits — its players are fan-friendly and charity-driven, she says, and the game combines skill, strength and speed with limited stoppages and few replay reviews. Plus, of course, as NHL devotees with tell you every spring, its postseason is the best in professional sports. She’s got a point on all of that. And I won’t watch a second of it. However, I have promised Anna to delay my funeral, if possible, until after the Capitals are eliminated from this year’s Stanley Cup playoffs. A. I’ll say this: Social media might save lives. If Twitter were around 200-odd years ago, there may never have been a Burr-Hamilton duel — they just would’ve lobbed nasty tweets back and forth, and Alexander Hamilton would be alive today. A. What? Officiating again? I didn’t see it — I was on my third Yeungling while watching, for the third time on tape, bowler Jason Belmonte win his record 11th major title last month. A. Please suspend all contact with me indefinitely. Published: April 8, 2019, 6:50 p.m. Updated: April 8, 2019, 10:23 p.m.